Intro from Jay Allison: Our Tools Editor Jeff Towne has subjected another new digital audio recorder to his rigorous examination. He says, “The Zoom H4n combines two strong points of the company’s previous audio recorders: XLR mic inputs on a small handheld device, and simultaneous 4-channel recording….Zoom made the H4n so versatile that the many options make changing settings more complicated than is ideal, but it still can operate fairly simply as a basic field recorder as well.” Jeff thinks it’s a pretty impressive machine for about $300. If you’re in the market, check his review, with lots of audio clips and photos, as usual. The Zoom H4n combines two strong points of the company’s previous audio recorders: XLR mic inputs on a small handheld device, and simultaneous 4-channel recording. The graphics on the manual indicate that the “n” is for “next” and this machine is indeed a step forward, it is uniquely able to record from the built-in stereo mics and from external sources at the same time. The original Zoom H4 and H2 sounded amazingly good when using the built-in microphones, but did not deliver the same sound quality when recording with external mics. As handy as pocket-sized recorders are, reporters and audio producers often prefer to use a particular microphone to record interviews, so a recording device needs to interface well with that external equipment to be truly useful. The Zoom H4n is a significant improvement over the earlier Zoom models in that respect: it’s possible to get very good audio quality using professional reporter’s microphones. But, as has been the case with almost all of the small recorders that we’ve reviewed here on Transom, one gets significantly cleaner sound when using high-output condenser microphones. As with the earlier Zoom recorders, the H4n seems primarily targeted toward recording of music, less so to recording of quieter events, such as conversational interviews, or nature sounds. Even with high output condenser microphones, the record level needs to be turned up fairly high to record a typical conversational voice, which tends to accentuate any noise inherent in the mic preamps. So the H4n is not going to deliver pristine, crystal-clear sound in most interview situations, but it can make recordings that are clean enough, if one uses the right microphone. The versatility of the H4n extends beyond the built-in stereo mics and dual XLR microphone inputs. It also has a stereo mini mic input, which allows easy interface of microphones wired for use with smaller recorders, and surprisingly, that input even delivers a louder; cleaner signal with many mics than the XLR inputs do. It’s still a bit hissy with dynamic mics, but it works better than using the XLR jacks with those low-output mics. So in some circumstances, it may be preferable to use an XLR-to-mini adapter on one’s microphone, even though the recorder has XLR inputs. One downside of this connector are that phantom power cannot be supplied to condenser mics (although “plug-in power” can, if you have microphones that require that type of current.) Another is the placement of the jack on this recorder: it sticks out the back of the recorder, making it hard to place the H4n on a flat surface with a mic plugged into the minijack. That will not be a problem if you tend to hold the recorder in your hand, or mount it on a tripod, or if you exclusively use the built-in mics or XLR jacks. If one prefers the secure, balanced connection of an XLR jack, or if the microphones require phantom power to be fed from the recorder, the XLR jacks are perfectly viable with high-output condenser mics. Dynamic mics will work fine with loud sources, like recording amplified music, or collecting voices in a crowd, but for conversational interviews in a quiet space, dynamic mics do not provide enough output level, resulting in hissy audio when levels are adjusted in a digital editor. The built-in mics are great for collecting ambiences and live music, they provide a vivid stereo soundstage, which can actually be adjusted, with a twist of each mic capsule, from a medium-wide 90-degree spread, to a super-wide 120-degree pick-up pattern. That difference in angle creates a subtle difference in the width of the soundstage of distant sounds, but is more dramatic when recording widely-spaced sound sources at closer distances. Here is the sound of tennis players warming-up, recorded from about 50 feet away. The built-in mics aren’t ideally suited for close-up recording of voices, but they can work in a pinch. The H4n is fairly simple to operate in relatively conventional ways: select the built-in microphones and point them at what you want to record, or select the external inputs and plug-in a mic (or mics) and go. But the truly intriguing thing about the H4n is its ability to do both at once. The potential applications are numerous. One could close-mic a subject and interviewer, while the built-in stereo mics record the ambience of the space. One could use both a lavalier and shotgun mic to record a subjects voice while directing the built-in mics at something he’s demonstrating. A musical performance could be captured with the stereo mics, with external mics positioned more optimally for conversation with the performers. The line-level outputs from a mixing board can be plugged into the H4n’s external inputs, while the built-in mics pick up the room sound. These different inputs are recorded as two separate stereo tracks, one for the internal mics, one for the external inputs, allowing for flexible editing and mixing after the fact. The H4n even has an internal mixer and the ability to bounce multitrack recordings down to stereo if so desired, which could come in handy in the field, but one has much more control over the results when working on a computer-based digital audio workstation. The two files that result from recording in 4-channel mode can be simply placed at the same start time when imported into a multitrack editing session, possibly making small adjustments to avoid phase conflicts (interference resulting from audio waves reaching different microphones at different times.) These separate files could also be used to make a surround-sound mix, if one positions the microphones correctly during recording. But even if one never uses the 4-channel or multitrack modes, the Zoom H4n is an attractive recorder in other ways. It feels more solidly-built and it’s easier to use than the original H4, with fewer adjustments needing to be made via menus. And navigating through those menus is (slightly) easier, with a more straightforward process for scrolling and selecting. The procedure is still a little less than ideal, with a menu button, and a separate scroll wheel, which is then pushed-in to make a selection. Pressing in on the scroll wheel is not foolproof, it’s easy to accidentally scroll up or down instead of pressing in. And the menus are still a few levels too deep, compared to the structure of some other recorders’ menus. That said, it’s not that hard to find one’s way through the trees of options. And there are many options, some of them specifically of use to musicians using this devices as a tiny multitrack studio. But most can be set once and forgotten. The H4n can record wav files at 16 or 24 bit, at 44.1 or 48 khz. It can also record in various flavors of MP3, which saves space on the SD memory card, but is not advisable for any critical recordings. Save the compressed formats for final delivery. Large memory cards are cheap these days, record wav files. The H4n comes with a 1-gig SD card, which can hold about 90 minutes of stereo recording at 16-bit, 44.1 khz. Larger-capacity SD and SDHD cards can be used, although individual soundfiles should not exceed 2 gigs. The default recording format is stereo, even when engaging the mono mix function, which allows a single external mic to be heard in both the left and right channels when monitoring the recording. This chews up twice as much disc space as recorders that offer true mono recording, but large memory cards are increasingly affordable, so it may not be much of an annoyance if one has a big enough SD card in there. The H4n does allow true mono recording by using its multitrack recording mode, but for quick and reliable field recording, it’s often preferable to avoid the more complicated configuration of multitrack mode. 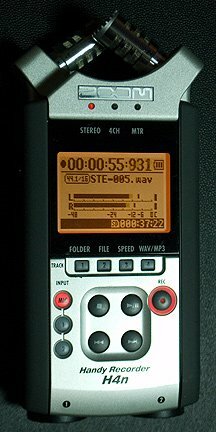 It’s great to have the multitrack capability if one needs to record in mono, or layer overdubs as part of a more sophisticated production, and one does not have access to a computer, but in its more common role as a basic field recorder, it’s easier to keep the H4n in stereo or 4-channel mode. Multitrack (MTR) mode requires more complex set-up and routing of inputs to tracks, and even has a mode that allows recordings to overwrite earlier recordings, so the use of MTR mode must be done with great care. There are many extras and effects designed for use with multitrack mode, but some of those can be useful in stereo or 4-channel mode. There are a few flavors of compressors and limiters, which seem to be either too heavy-handed or relatively ineffective, but there may be a setting that works for the particular sources you’re recording. In most cases, the limiters did seem to keep the soundfiles from clipping, although the meters, and monitors, seemed to indicate a crunchy, distorted overload while recording. If you’re willing to trust those effects, you can use them to guard against loud spikes, but I’d recommend just setting your record levels conservatively and adjusting for peaks at the editing and mixing stage. The Automatic Gain Control is surprisingly effective. In most recorders, this function results in unpleasantly pumpy, irregular levels, as the automatic circuit adjusts up and down in reaction to the input volume. Zoom handles this differently, and the H4n implements it even more elegantly than earlier models did. With AGC turned on, the recorder sets a level based on the volume seen while in record-ready. This can be problematic if the volume will increase significantly after recording starts, like starting a recording in the quiet before a performance begins. Luckily, this latest design of the AGC adjusts on-the-fly as well, but not in a wildly varying way like old-fashioned circuits did. If the input exceeds -6db on the record meters, the AGC circuit smoothly turns the input gain down, displaying the new input level setting for a few seconds. In practice, this results in surprisingly natural-sounding level adjustment. Setting levels manually and adjusting when necessary still usually results in better recordings, but when confronted with unpredictable environments, a good AGC can sometimes be a lifesaver. This waveform display shows that much louder sounds will still need to be smoothed in the mix, but the AGC didn’t let the recording clip, which would create crunchy distortion. Operation in stereo mode is fairly straightforward: press the record button once to enter record-ready mode. The record light will flash, but the counter will not move. if AGC is off, set the record levels by adjusting the up-down rocker switch on the right side of the device, accessible easily by one’s thumb, when one holds the recorder in one’s right hand. Press the record button a second time, and recording begins. Many people have been fooled into thinking that they were recording, when they were actually just in record-ready, it’s just something that one has to get used to on this machine, the blinking red record indicator means ready, not that that you’re rolling, you need to see a solid, unblinking record indicator to assure recording. It’s good practice to frequently check the meters to verify that the levels are good, and it’s worth getting in the habit of making sure that the time indicator is running too, just to make sure that you don’t conduct an entire interview in pause. 4-Channel mode is not much more complicated, one just needs to set record levels for the internal and external sources separately. While in record-pause, simply press the hardware buttons on the lower left of the face of the machine for MIC or (external input) 1 and 2, and adjust the record level rocker switch. Once the recording is finished, press stop and the file is saved into one of several folders in a few pre-set directories, for stereo, 4-channel, or multitrack recordings. You can define what folder a recording goes into ahead of time if that helps keep separate projects organized, but by default, recordings go into the first folder. Transferring the soundfiles directly from the H4n to a computer is slightly more complicated than for some other recorders: it needs to be set for transferring data, which is selected by pressing the menu button, navigating to USB, then selecting USB>>Storage. The H4n will then show up as an external drive, when connected to a computer with a standard mini-USB to USB cable. The other USB mode allows the H4n to be used as a standard audio interface, if one wants to use the devices built-in mics or external inputs as sources when recording directly to a computer recording application. Zoom provides an AC adapter for the H4n, which is increasingly rare these days. This is especially useful when transferring data via USB, or using it as an interface, but is also good for longer recordings when AC power is available. Battery life is quite respectable, given that it runs off of two AA batteries. In most modes, one can expect about 6 hours of operation from a fresh pair of Alkaline batteries. However, the H4n also has a “stamina” mode that allows the recorder to run for much longer, closer to 10-11 hours in our tests. That mode is engaged with a hardware switch in the battery compartment. The catch is that stamina mode only works when recording in stereo mode at 16-bit, 44.1 hhz, not in 4-channel or multitrack mode, or at higher bit-depths or sample rates. One other minor quirk, brought to my attention by Brad Linder, is that one needs to be careful about how one grips the machine. When held in the left hand, it’s possible to accidentally press-in on the SD card door, which can cause the SD card to eject, which would, of course, ruin a recording in progress. There is a standard tripod socket on the bottom, and a short cylindrical handle that screws into that hole is provided with the H4n. That handle is designed to fit into a standard microphone clip, but could also be used to hold the machine. That could avoid the potential problem with the SD door, and also reduce handling noise, which is readily picked-up by the built-in mics (as is the case with all of these handheld recorders.) Putting some foam around that handle would reduce handling noise even more. For long, stationary recordings, either attaching the machine to a standard photo tripod, or using the screw-in handle and a mic stand, is advised for positioning the recorder more accurately than just laying it on a flat surface. Other than the possible complications of the minijack protruding from the back of the device, the H4n is not bad ergonomically. It’s one of the smallest recorders that provides XLR inputs for microphones, a little more compact than even the Tascam DR-100. Despite the more reliable XLR inputs, the mic preamps don’t provide quite enough gain to practically use popular reporter’s microphones in most circumstances. When using higher-output condenser mics, the sound quality is much better, although not completely pristine. The built-in mics are quite good, but the main appeal of the H4n is its ability to record from those internal mics and external sources simultaneously. Navigating through the menus is still more convoluted than many other recorders, but it’s better than on earlier Zoom models. When in stereo mode, the four Track buttons beneath the display allow simple access to some functions buried in menus, although they’re not the ones I would have chosen… In practical use, most of the settings can be adjusted once and forgotten, so recording is quick and easy. Zoom made the H4n so versatile that the many options make changing settings more complicated than is ideal, but it still can operate fairly simply as a basic field recorder as well. If you need the capability of recording from internal and external mics simultaneously, this is the only compact, portable device that makes that easy. Using the H4n as a little multitrack studio is much more difficult than doing the same thing on a computer, but it’s impressive that it’s possible at all. Putting all these capabilities in a small package that sells for approximately $300 is even more amazing. It’s frustrating that the sound quality is not great when trying to record spoken voices with dynamic microphones, but if higher-output condenser mics are used, the noise levels are much reduced. This is the case with many small flash recorders, and at least the H4n allows use of a wider range of condenser mics, because it can provide standard phantom power via the XLR inputs. Overall, I prefer the sound of the Tascam DR-100 by a small margin, and its simpler operation by a lot, but the Tascam does not allow recording from internal and external mics at the same time. And the Zoom’s external mics are a little better. The Zoom H4n might be more complicated than is ideal for someone that just needs to record basic interviews and the occasional stereo ambience. But it can do an fine job at those tasks, and much more, if the need arises. The four-track recording can be very handy in some circumstances, and if that function is appealing, this just might be the recorder for you. i was wondering what kind of carrying case do you use for the zoom h4n? all the cables plus mic get messy quick. is there a bag with a hole in it for the cables to extend out? that way you can hide everything except the mic and the headphones? I have owned the previous model, the H4 for nearly three years with almost daily use and have no complaints. Sure there is a bit of a noise floor but I really have to strain to hear it. Also when I am utilizing this or any other "field" recorder in the "Field",the external ambiance far outweighs any internal "noise" the unit may generate in and of itself. The H4 admittedly, does require some post when using the onboard mics as their is some phase cancellation. That’s not a challenge though if one has a plugin or external module such as the BBE enhancer. When coupled with the recorder itself I have rendered quite a few impressive llve music,& spoken word/poetry recitals . Etc. Did You Really, Actually Physically Hold an H4n??? I’m holding my H4n as I write this. Good review until you got to the quirks. Simply pressing on the SD card door does NOT force the card to eject. Deliberately pressing very hard on the door did. This is not easy to do accidentally. It took a lot of pressure with the tip of my thumb in the center of the door to eject the card behind it. I wouldn’t worry about accidental card ejects. Next,(and this is where it gets interesting) is your description of the location of the threaded camera tripod socket. Folks, it’s dead-center in the BACK of the unit (not the bottom)!!! The H4n is intended to be used lying horizontally on it’s back, front side up. This (the recording position) IS the real ‘quirk’. Your expected to point the mikes towards the sound source to obtain optimum stereo imaging on the recordings. This horizontal position sometimes places the H4n’s controls and display in an awkward position relative the person operating it (like upside-down when recording oneself). I also don’t know why they didn’t provide some type of protection for the mikes as is done for the Zoom H4, the Sony PCM-D50 and PCM-D1, and the Alesis ProTrack, Nonetheless, the H4n is a fantastic audio recording device for many times the money. I think the best protection for those mics is to routinely have it wear the windscreen as a buffer for mechanical encounters AND (obviously) air noises, like pops and wind. And don’t forget a remote for when it’s pointed AT you….can’t have it BOTH ways you know…you’re either pointing it away from you or toward you…if you’re gonna have to work with it…and in my experience, if I’m recording ME singing a song, I will have it tilted also, so one channel is getting more guitar, while the other is getting more vocals and placed about 1/2 between those two sources…so, I put it in rec-pause mode, place it just right and then only have to find that button once more to ROLL…then let it go until the session is over and edit the file with Sound Forge. Test done with Battery or AC power? Just wondering if you tested the H4n and c900 combo with the h4n battery or mains powered? I have a RODE mic i use with my Canon 7D, it’s the one that sells doe $149.00. When I plug it into the Zoom mini mic plug, do i need to set any of the inputs in menu on the Zoom or does it automatically disable the built in mics? It disable the intern mics, but remember to add in the menu PIP Off as the Rode has a internal battery. I have used only the internal mics of the H4n and have been very happy with the results. Are people using a external mics for sound or because it is less intimidating to have a mic pointed at someone than the unit? I bought a Zoom H4N recently only to find an annoying rattle from the record button, which was loose. I got a replacement and discovered the very same thing, then checked the other H4Ns in the shop – and they all had a rattle! Wondering if anyone else out there has had the same problem. Colleagues who bought this unit last year don’t seem to have the rattle. Very annoying, as it means I essentially can’t use it for interviewing, as even a slight movement produces the noise. Also, I taped up the buttons on the replacement unit to see if this would help, but the rattle seems to be on the inside. Be very careful how you treat the H4N it marks easily and the doors for battery and SD card break easily. Buy or make a cable splitter for the mini stereo input and then you have a 4 track mono recorder, this is how I configured the H4N for a recent film shoot, putting two Lav’s into the extra mic in and using a Sound Devices Mix-Pre to feed a boom and another Lav. In this config using the line inputs I set the level to 1 and extra mic input level to 10 and then the noise floor was minimal and it allowed the lav’s and Mix-Pre to do all the work. Lav’s are line level out so they do not need a high gain level. The H4N performed really well and sounded great. Also if you are using this for moving image I recommend not pausing the take but stopping it so as to create separate takes and not one long audio file. Also buy Pluralise to sync in post to your in camera reference audio file. Yes the on board mics need protecting I bent one already by banging against a wall :(. The H4N is not built to last, use it and abuse it then buy something better like a Sound Devices 722 🙂 which are amazing by the way. Hi Mat, any chance you’d be willing to walk me through that setup you were using for the film shoot? I’m trying to do something similar with the H4N but am having trouble with the settings.. thanks! I seem to be having an issue with my H4n, I am in stereo mode using the on board mics. I push record and that starts the preview levels. The left mic level is very low almost not even there while the right channel is in the middle area. This has been happening all week. Is it possible to set the on board mic levels separately? For example like you would usually set the rec levels by simply pressing the mic level on the side, that seems to effect both at once never independently set each. or do you think i have a busted left mic =(. Hello! Nice reeview but I am kinda confused…. Zoom H2n or Edirol﻿ R-09HR?? please someone tell me which is better! Thank you! Thanks for doing this review with actual variations in testing. I found it very useful, and it — along with user comments —has persuaded me to go ahead an buy one for podcasting and ambient sound recording in the field. I purchased an H1 to try first to hear if it’s good enough, but am disappointed at the noise that transfers through the somewhat thin plastic case. The built-in mics do a good job, but I may as well spend 170% more and get the H4n with many more features. Hi. I’m a freelance radio journalist but still playing around with the Zoom. Have used many recorders in my career. One thing I can’t seem to find the answer to – how do you record audio from television onto a Zoom? I’ve tried single jack lines, cords with the red, yellow and white plugs connected to the Samsung TV. Do you just have to change the input settings on the Zoom? There’s nothing that looks appropriate. The Zoom brochure doesn’t quite touch on this either. Thanks. I’ve been using my ZoomH4n very successfully in stereo mode. I feed my Kawai digital piano and a Barringer condenser mic into a Barringer 602 mixer and from the mixer into the two input jacks on the H4n. Is there something about this setup that is preventing me from recording in MTR mode? I’ve noticed the weak mic performance of the Shure SM-87 and Beyerdynamic TG X48 dynamic mics going into the XLR inputs of the ZoomH4N. Can you recommend a better (condenser?) mic for in-the-field personal handheld interviews, a la radio reporter mode? The audio is typically used for podcast interviews. As you know, the two mics I referenced come with some unwanted sound floor when I boost the -18dB levels in Audacity or Audition. 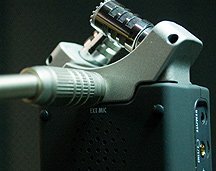 You need real mic pres to record dynamic mics properly. Maudio DMP3 is pretty good for the money. I’ve owned the H4n since it came out and it’s been great at recording using the built in mics. I’ve tried, with no success, to use external mics and the mini-jack. This review confirms the level concerns and the work arounds. Thanks a lot for that. I have used the limiters at loud concerts and they’ve worked fine. Wish I knew about the ACG setting. That seems like an even better option. I never understood an application for the 4 track mode but I like the application of capturing backgrounds with it. And, I’ve never twisted the mics to change angles. Listening to that tennis court demo made me a believer that it can make a difference.